Over the last year or so I have met some new (and rather special) wargamers, plunged into a new period, and started writing a new set of rules for which I have some pretensions to publish. 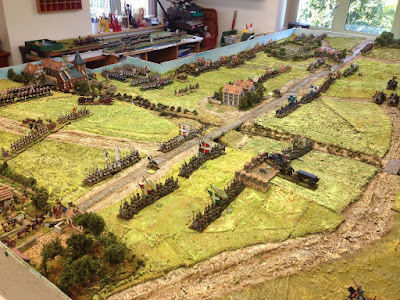 These experiences have caused me to reflect on the nature of contemporary wargaming with miniatures, and how my view of it is perhaps rather blinkered and probably more than a little old-fashioned. One of a lovely set of photos recently posted on the HoW forum. If you are a regular reader you will know my approach to the hobby was shaped by the early wargaming books that emerged in the 1960s and early 1970s, most importantly those by Donald Featherstone. No matter how many websites I now visit, and no matter how many contemporary magazines I consume, I have come to realise that the basic impression of what wargaming is about that I took on board back then, has stuck with me ever since. It has done so because it chimes in exactly with what I want from the hobby. So, according to me, wargaming springs from an interest in military history. Therefore, all wargaming is historical wargaming. Warhammer, for example? Some weird spin-off played by kids, which is definitely not real wargaming. Therefore, the first thing a real wargamer does when intending to play a particular period of history is to read lots of books. Of course, all proper wargamers will have a significant but carefully selected collection of military history books. From these, you acquire a basic but sound knowledge of the political and military background of your period, the way battles were fought, the various troop types involved, how they were organised, their strengths and weaknesses, who won, who lost, etc. etc. Then you might think about which rules to use, and after that what figure and model ranges you might look into. Size? Well, 28mm ideally, or perhaps 20mm. I have compromised on 15mm for WW2 games due to the movement speeds and weapon ranges. Smaller than that? Forget it. This is about playing with toy soldiers and any size smaller than 15mm are just markers or counters. One can't tell the difference between 'grenadiers' and 'line', or an MG team and a mortar team. At least not with my eyesight. This then, is my view of what wargaming ought to be. 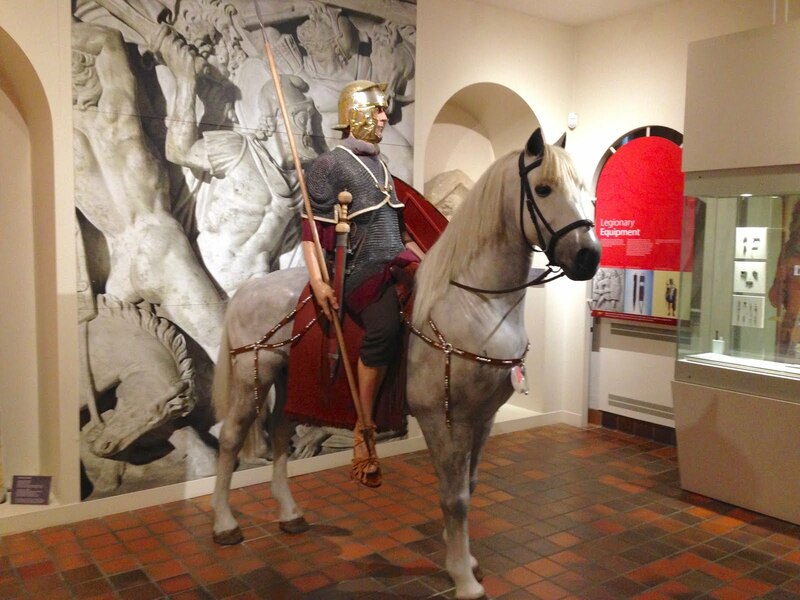 Off to the Corinium Museum in Cirencester for some solid historical research. The point of this exposition is not to deride those who don't share my concept. It is rather to point out that I don't, even after all these years, appear to fully understand or appreciate what the hobby of wargaming with miniatures involves, here in the second decade of the 21st century. My blind spots are mostly without any rational basis. In rational terms, there is no difference between Warhammer 40K and Honours of War as hobby activities. Now, in the case of 2mm figures I stand by my judgement that these are no better than cardboard counters. Not that there's anything wrong with cardboard counters per se, it's just that they are not part of wargaming with miniatures. And neither are 2mm figures. 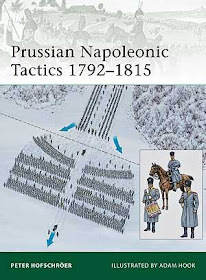 But of course, my Seven Years War games are no more 'real' or 'appropriate' than fantasy or sci-fi gaming, and my careful representations of historical battles are no more central to what wargaming is than any 'pulp' skirmish. This I know with my rational mind, but my gut reaction is always to ignore such games as being not worthy of my attention, and somehow to regard those playing them as rather weird people who have somehow missed the point. Strange, isn't it? This impacts on my appreciation of hobby trends. 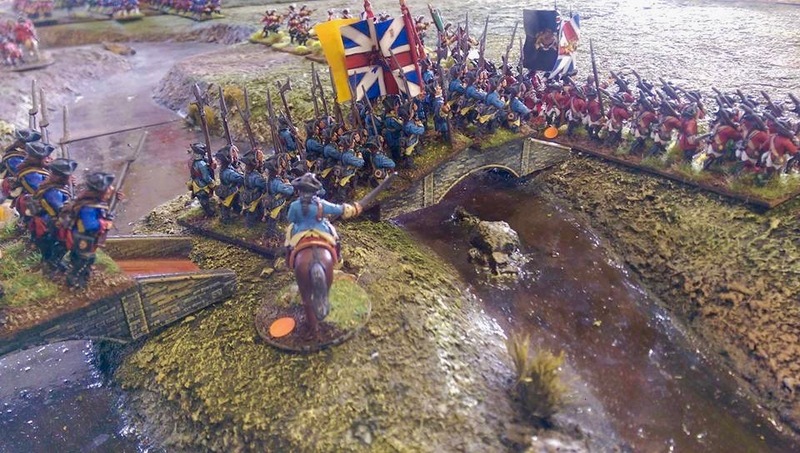 The Osprey Wargames series of rules, of which Honours of War is one, are dominated by skirmish sets, often non-historical and featuring fantasy and pulp themes. In considering pitching my ancients rules to Osprey, I foolishly assumed that they would be gagging for a 'proper' set of wargames rules, relating to 'proper' size battles in a 'proper' wargaming era. Of course, after receiving some real world advice, I was brought to realise that Osprey publish what they publish because it sells well, and fits in well with the format and concept of the series. And lots of wargamers are really pleased with what is on offer. HoW is actually something of an odd one out (though I could hardly have hoped for a better first time experience with this fine company). Why does stuff like this leave me cold? Another example is figure poses. Once again, I find myself bemused by the desire for figures in a variety of dynamic poses. I have been collecting some 28mm hard-plastic figures recently, and apparently contemporary wargamers love lots of head choices, weapon choices, arm choices, etc... No two figures can be the same. I find myself thinking, "who the hell comes up with these ideas? - all I want is a set of figures all in the same pose looking neat and tidy, ideally with no confusing choices, and which are easy to base because they don't get in each other's way". Unfortunately, rather like the tubby metal figures with exaggerated detail we are also so used to seeing these days, the modellers and painters have taken over. Strangely and inexplicably, the people who make model soldiers are just as happy to sell figures to those who enjoy modelling and painting, as to those who just want toys to play games with. Yes, there are some people out there buying and painting wargames figures who don't actually wargame with them. Ever! Shouldn't there be a law against this, my prejudices tell me? Of course there shouldn't. Keeping sales up keeps the ranges alive and improves availability for everyone. I won't even mention my absurd, and rather patronising, distaste for those who strive for the highest standards of figure painting. This distaste has received some airings in the past, and on one occasion prompted the highest number of comments on a post I have ever had. No. I'm definitely not going to mention that subject. Except to say that I still don't really understand that to some people painting figures is more important than getting them on the table and fighting battles with them. But there it is, you see. I really don't understand. The failure of understanding is mine. Therefore, I am schooling myself to accept this attitude as a fact of wargaming life, and no longer get worked up about it. Ah, the beating heart of the hobby! A 28mm Horse and Musket game set up by Chris Gregg. One final problem I can't rid myself of is a suspicion of what I call 'corporate wargaming', meaning the more fully commercialised and generally business-oriented end of the hobby, mostly run by ex-Games Workshop employees. 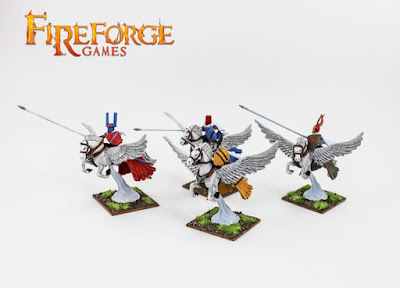 I think the worst bit is the commercial need to constantly re-invent products in order to keep revenue up - the 'codex creep' of GW is mirrored by the new editions of rules from certain other companies that don't really need new editions. I remain very much the sort of old-fashioned wargamer who just wants a set of rules, in a reasonably produced but modest booklet costing maybe £10-15. I can work out the rest for myself. But even here I am changing my outlook. My current WW2 rules of choice are the Battlegroup series, which could have been tailor made to irritate me with their £20 coffee table basic rules, and £25 coffee table supplements which are necessary to play the campaign of your choice. But I find myself embracing the whole thing, as I have come to like and trust the 2 authors (mainly via the decent Battlegroup forum), and I like the rules, which I am assured are finished with and won't be updated just for the sake of it. There we are; I must be growing as a wargamer! I won't be changing my wargaming preferences any time soon, of course. In fact, I can confidently state that old-fashioned historical wargaming will remain my only interest in this hobby. But increasing one's understanding of what the hobby is, and what it's realities are, is a journey worth making. It's just strange to see how long it has taken me to fully appreciate my dinosaur-like blind spots. You like what you like. 'nowt wrong with that. As long as you and your gaming friends are happy who cares? I share some of your prejudices as well Keith. This is interesting, because I have arrived there from a different starting point. I started gaming in Warhammer and fantasy games with their obsession with overly done up paint jobs and multiple wacky poses. I have, as I've aged and hopefully matured, come to appreciate the 'old fashioned' aesthetics of single pose models and simple paint jobs. So to say that your preferences are in any way nostalgia is likely an oversimplification and inaccurate. I do believe single pose models are superior because they allow room for the gamer's imagination to fill in the blanks. An overly wrought figure less a piece of gaming art and more so a statuette to be displayed in a diorama. I play games because I like toys and games - not to take them so seriously that I would not play with them. Its always good to know and acknowledge what one likes and dozens. We share a common starting point and I think many preferences (even though I've gone from doubting the continued viability of those great big 25's in the 80's to now considering 20mm as my smallest viable size and 40mm as quite normal) but I got infected by exposure to fantasy by Minifigs and Phil Barker amongst others in the mid-70's though purely in an OSW fashion! I understand the painters out there as I painted "Model" soldiers before I wargamed but I just don't get the legions of those who buy what they are told, have to have a new game every year, and seem to think it a crime to think for oneself and experiment a bit. Same starting point - different end point. I like painting figures and do apply that little bit extra in my painting where I can. To that end the GW part of the hobby has helped tremendously. I don’t play it but it does bring some techniques in paining and modelling that I can appreciate. Just like you I am also wondering why the need for multiple poses and variety, especially in periods where uniformity was sought and upheld. Ultimately I want good looking figures on a good looking table and lots of them. Keith we are virtually the same age and again like me you begin to take stock of a lot of things, both in the hobby and about life in general. When we started on our wargaming odyssey there was no such thing as fantasy or sci fi. When it came I just didnt want to know, to me that wasnt proper wargaming, it wasnt based around historical events. Similarly with figures, once I was able to buy 'real'figures I started buying metal. Plastic was for children. It had to be 25mm or nothing. I was then shown the light of wargaming Napoleonic battles in 6mm and for many years I would promote the beauty of this scale.Ten years ago I reverted back to 28mm. I eventually realised that wargaming is a very broad church and is the better for this. I still have my dislikes, zombies being one, but thats someones own choice and if they are happy, why not. Perhaps we have realised that as long as wargaming makes us happy why worry about trends that others follow. Good post by the way. Keith, we both sing off the same hymn sheet here (even if I did used to play Warhammer and collect some stuff in 6mm in the dim distant past). A good and thoughtful post. HoW are my go to ruleset of choice for the 18thC. The other Osprey stuff just leaves me cold. Thanks everyone for your thoughtful replies. "As long as wargaming makes us happy why worry about trends that others follow". Wise words indeed. What concerned me is that I *was* worrying about the trends that others were following. Not in a big way, but it was holding me back from fully appreciating the hobby and how it works these days. As always Keith, a thought provoking read. A lot of what you said rings true with me and I have re-assessed what I like and want in wargaming over the past few years. So now I worry less about how well my figures are painted, am happier with simpler terrain and the game is what counts the most. As long as I'm happy with my gaming set up, that's all that matters at the end of the day. I really enjoyed reading your blog entry. I'm slightly older than you, but my wargaming career had a very similar starting point. I also seem to share quite a few of your views. I'll return to read your blog again. Flattered to have my set up referred to as the "Beating heart of Wargaming" by the author of HoW, perhaps I should make a sign to go over the door warning any visitor fitted with a pacemaker! But as I get older, I do, like Paul Robinson, respect a table full with decently painted figures parading over terrain to do them justice. Thanks Chris. As for smaller scale figures, I was laying my prejudices bare rather than making a pejorative statement. Some of my best friends use 6mm and 10mm figures! But as with my other assumptions, my rational appreciation of the value and uses of smaller figures is at odds with my personal chauvanism. I guess the post was partly an attempt to be a more PC wargamer. Time to set aside bigotry and prejudice! Then I might get more from the hobby. Excellent post. The bads news is most of the people who read your blog are "like minded" people. By definition, I am also a like minded person so don't feel too bad about it. I wonder what an "ex-GW businessman" would say in reply? Thank you Scott. A term I have encountered is 'the professionalisation of the hobby', which I found interesting. In some ways it can be a good thing, but I fear that in other ways it might change the rather pleasant and definitely fundamental concept of a bunch of creative amateurs working in relative harmony. But the present situation seems to indicate that our amateur, friendly and cooperative hobby is alive and well.